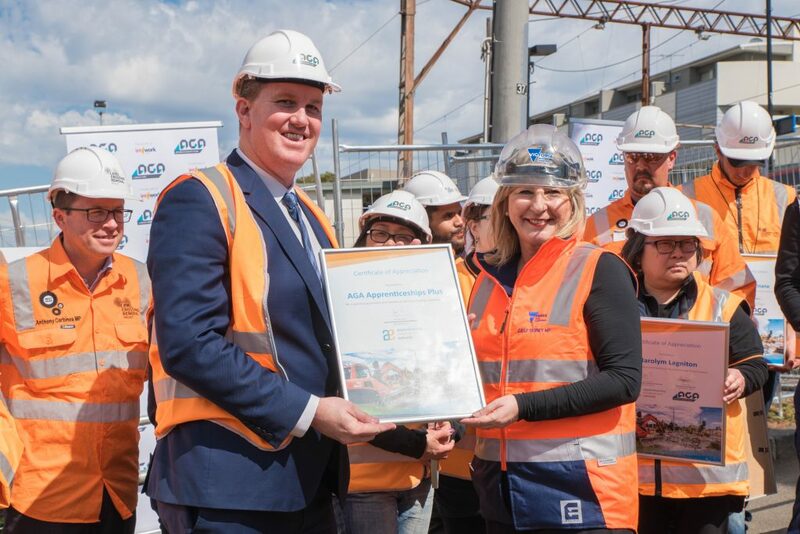 Earlier today the Honourable Gayle Tierney, Minister for Vocational Education and Skills, and Minister for Corrections, presented a number of certificates to apprentices and trainees working on the level crossing removal project at lower plenty road Rosanna. 18 months ago the Victorian Government established a program to support workers effected by the closure of the automotive manufacturing industry – south east auto transition (SEAT). Through the Apprenticeship Employment Network (AEN) Apprenticeships and Traineeships were identified as possible pathways for workers that would need re-training into another career. 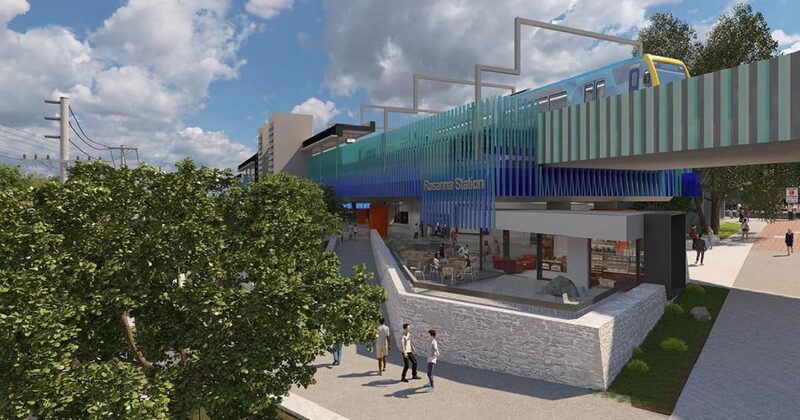 The AEN are part of this project with Victorian TAFEs to support workers into new careers. 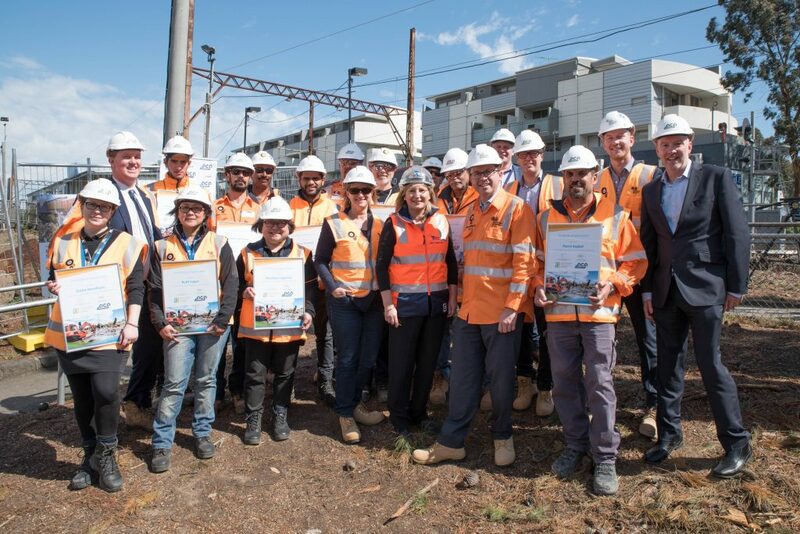 The level crossing removal construction site in Rosanna has engaged 14 apprentices and trainees in total through the group training program offered by AGA. AGA have also recently placed two ex-auto industry workers into automotive mechanic apprenticeships in the Northern Suburbs. The SEAT project is expected to support 250 mature aged workers into apprenticeships and traineeships over the next 12-18 months. This project demonstrates that apprenticeships are a great way to support local projects, employers and workers of any age into a new meaningful employment pathway. For further information about the SEAT project please click here. The alliance members are Laing O’Rourke, Fulton Hogan, Jacobs, Metro Trains Melbourne and the Level Crossing Removal Authority (LXRA). The program alliance is an innovative approach to alliance contracting developed by LXRA to expedite the removal of 50 level crossings in metropolitan Melbourne over an eight-year period. Burgundy Street; and duplication of the rail tunnel under the Darebin Street/Hawdon Street intersection.